Whenever I have a new fabric or a fragment of an idea in mind, sometime after 4pm & sometime before getting dinner sorted, I sit down with a glass of vino & enjoy looking thru' my latest quilting magazine or one of my patchwork books, admiring & drawing inspiration from others. And I am thinking alot of us still get our inspiration & creativity from the old quilts, yes? We can make something similar, or we re-interpret the traditional into a modern- fusion version, or we use them as a beginning & then wander off along our own creative path. The other day, on a bit of a mission, I sorted thru' quilting magazines I had in a box under the spare bed and another recent pile that was inhabiting my fabric shelving. The odd one did date back to 2001 I must admit! (Hey, that's what happens when you don't move house for over 40yrs -you should see my husband's garage!). I did find several patterns in those old magazines that still appeal to me - for another quilt/another time. Right now thou', I do want to use some old vintage sheets & pillow cases that were also cluttering up that shelf.. I don't have patterns for either idea, am sure I can wander along a similar path with my own version, but before I start cutting any fabric I still have questions... I am wondering if my old vintage & the "new" vintage will blend nicely together? and do I throw in a low volume selection? or have just one main background colour? And then, of course, which way do I go with the pattern - retro flowers? or 1/2 square triangles? Decisions decisions! Your thoughts? Oh, and all the magazines? well, I've donated them to the local op shop. I have been busy gardening & cooking this weekend ...yummy chicken soup from the new Donna Hay book which my daughter gave me recently. It was made the old fashioned way, you know - slowly cooking a whole chicken, straining the stock, & then adding fresh veges, risoni & shredded chicken meat. I also made an easy one pot apple cake, which is all gone now!! And I've finished my latest book just in time for book club this week ... "Barracuda" by Christos Tsiolkas (he also wrote "The Slap"). His latest is about one young man's hopes & dreams, and (I thought) an over riding feeling of never being good enough. Brutal, thought provoking, tender - I couldn't put it down until I finished. So, no sewing this weekend. First up, I popped out to see Cheryl @ All Things Patchwork and spotted this gorgoeus oriental fabric. I'm not a great fan of "oriental" quilts as such, but I do have a habit of throwing the occasional pretty print into most of my scrap quilts. Not sure re details of this fabric as there is nothing on the selvedge. I did buy1metre as I couldn't decide there & then what to use it for, but it will look great as binding maybe, or added into something! Then a few fabrics arrived from Fabricworm. This pretty voile, Palos Verdes, that Rita over @ Red Pepper Quilts has used lately & I was so tempted! It feels v. light of course, however it'll fit in nicely with some of my Liberties I am using for my Marcelle Medallion. And I also needed the other fabric - Baby Geo in cream, Fox Field/ Tula Pink. It will go with just about everything don't you think? And at our last Monday Modern group Liz, I think, showed her latest Tula Pink fabrics, and one in particular really made me smile! Happy Dot in teal with these cute rabbits all over it! Not sure what to do with this yet, but I love looking at it! And finally, I ordered a blue/green Fat Quarter bundle of Ansonia, Denise Schmidt. I am slowly collecting little samples of her different ranges, they look quite vintage-y & I find I can add a little bit into most things I make lately. And I do know the blues in this group will never go amiss with me (it's my fallback colour for almost everything!). So a rather selective Sunday Stash, yes? It's Wednesday again all ready! a little bit of Valori Wells, as I seem to be drawn to purple these days! another colourway of Joel Dewberry's dainty daisies, so pretty! This is the wee piece of fabric that started it all. It's an oldish Kaffe Fassett one & I have used it here & there in my quilts over the years. And now this is all I have left.. not even a complete 9" square.. but I love it! 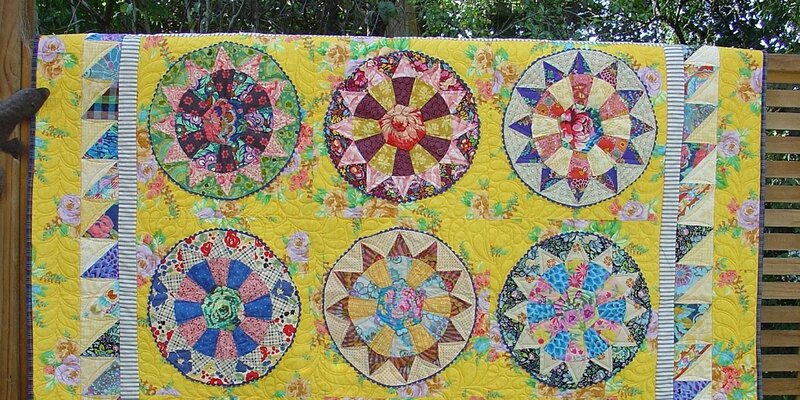 I selected a few fabrics to go with this lovely old piece and I had a Kaffe Fassett pattern in mind, "Shadow Pinwheel". I was thinking oranges/reds/purples, going for a sort of a gypsy look, and then I threw in a few pinks, blues, a bit of green & grey from assorted fabrics in my stash. This should work I thought, anything goes! End result = not very inspiring! So here I am borderline rejecting the whole idea today, and then I started to really look at the pattern! 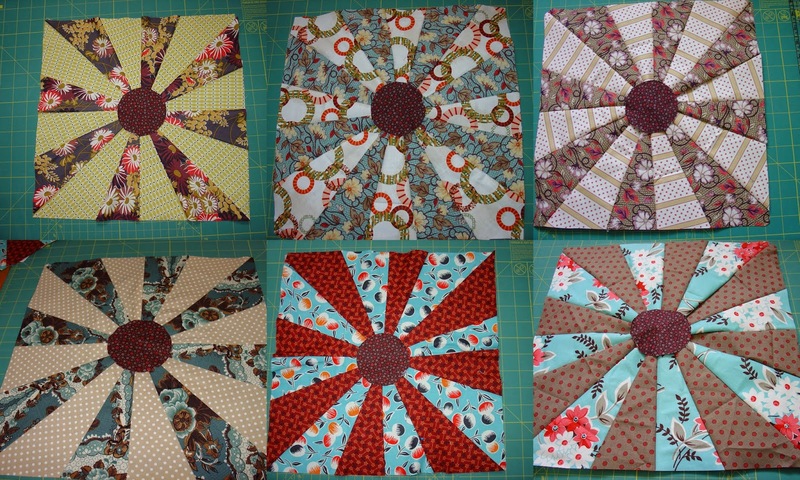 This is definetly a quilt based on values... hence the name I guess, Shadow pinwheel. Of course there's the expected light/dark coupling in the pinwheel blocks (4 7/8" squares cut on the diagonal), but there was also a rather vague light diagonal line running thru' the larger 1/2 square triangle blocks. And in some areas there's a merging of values all together, throwing in the odd "medium" fabric which I figure makes things a bit more interesting! 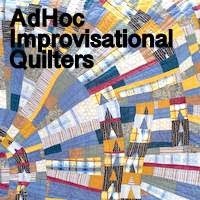 Most of us addicted to fabric find this style of quilt a really great way to use up "the stash". No worries about making fabrics match, I just simply needed to concentrate on thinking in lights & darks! I began cutting out a few trial pieces, you know, just to see. I had to handle the bigger triangles carefully, as the long edges were cut on the bias & quite stretchy, ( 8 7/8" squares cut on the diagonal). I'm thinking I will piece 1/2 of the quilt & then for the other 1/2, just repeat some of the combinations so it doesn't look too chaotic & messy. So far, I think it's sort of coming together ok.
and looking down onto the spare bed does the trick! For some time now I have been part of a group..... a sewing group that is!! Our Monday Modern is a cluster of enthusiastic quilters who meet on the first Monday of each month here in Auckland, NZ. We have a show & tell, a monthly challenge, and we are also having a monthly block lotto this year. We are quite a mixed bunch. Some of us do hand piecing (most noteably lately is Karyn! ), some of us are older(! ), some of us are internet savy, & some of us love the maths involved in patchwork, while some of us don't! We actually all do different sorts of patchwork, but are all keen to learn & share ... and ... we all love quilting! The latest NZ Quilter has a write up on our MM quilt show late last year, an interesting read. Lately, there's been lots of names floating around - modern/ traditional/ contemporary/ art/ vintage etc. so what is this "style" thingy all about? Personally, I'm not too sure myself! I just know I love making quilts. I love the processes involved in making a quilt, trying out new techniques, and mixing up my "old" with the "new" fabrics. I always feel there isn't enough time to make all that I want to, I swing from modern to vintage just like that, and then there's still things like the FMQ I should really have a go at! Now that I am retired, I'm so glad I have such a creative hobby! And the internet...well, I get a lot of pleasure from sharing with other quilters, & there's endless inspiration out there! And so what's my style? well, I guess I'd have to simply say "homemade.Linda"
(and hopefully that will cover just about everything, eh?!?). here @ http://r0ssie.blogspot.co.nz/2014/02/zombie.html where Rossie talks about how "fabric choice is not enough." Both my children have their birthdays very soon, and they are only 3 days apart! Over the years, I have ended up organising gifts & party plans over the Easter break. But of course now-a-days, they don't need their mum in quite the same way, nor do they need me to top up with socks & warm winter thermals. So this year they are both getting -you guessed it- a quilt each! Today I've been busy getting the bindings made & sewn on. I plan to do the hand stitching in the next couple of evenings. A few people in our Monday Modern quilt group have been machine sewing their bindings down (both sides), & say it's much easier, but I have not personally tried this yet. and echoes the machine quilting done by Annette. which really picks out the warm colours in the all the assorted squares. 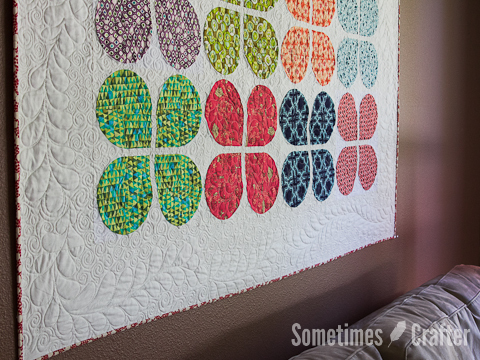 Her quilt is quilted in a "circular bubbles" pattern, again by Annette. 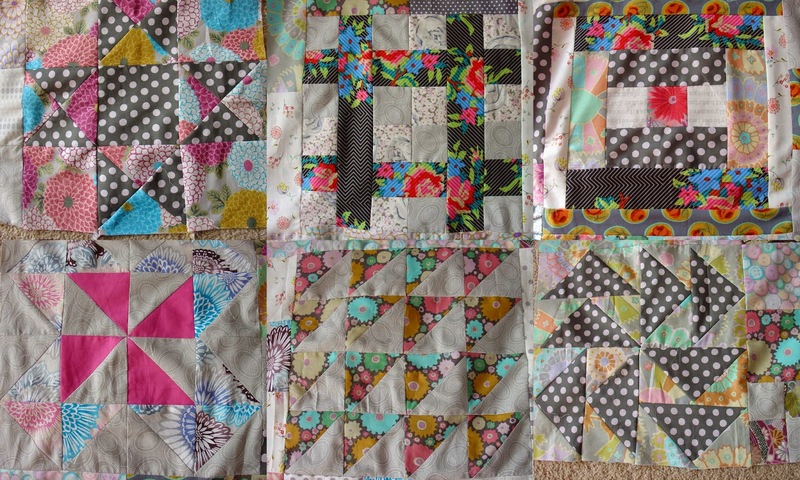 I have, belatedly, joined in with the Triangle QAL and needed to get busy to catch up. I wanted a random, scrappy look, and I did try to make a point of including more solids than usual from my stash this time around! As you can see thou', a few prints still found their way into the cutting up pile, along with some tone-on-tones! But nothing's right or wrong is it? It was fun sorting thru' my bits & pieces for the more "selective" scraps, and I kinda like the overall effect now it's all together. And let's face it, if I don't use up the stash....it'll date! Making a quilt from solely solid fabrics has never been easy for me. But I figured it was about time I tried! I sorted out some solid scraps and - just because it seemed silly not to - I sorted out some tonal print scraps too, ones that read as a single colour. Haven't even started sewing & I'm off the track already!! I decided to make a quilt that used a repetitive shape, like a hexagon, or a triangle, or a clamshell. 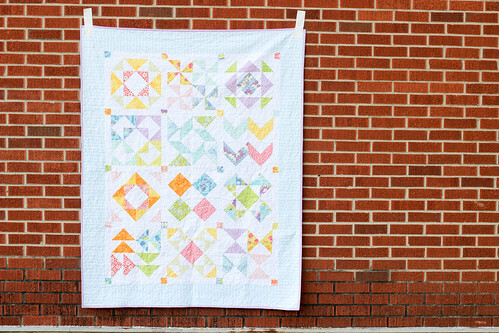 The overall effect created by using a one patch design can be very appealing, as we are seeing at the moment with all the triangle quilts around. So triangles it is then! ......and started to sew, just going for a random scrappy layout here! I really enjoy making scrap quilts, do you? There's a look of "making do" about them that I rather like. but also linking in with Lee @ WIP over at Freshly Pieced on Wednesday. Lots happening around here in my little sewing room! If you pop by my blog occasionally, you will have seen that I've been busy with a couple of easily pieced scrappy quilts, using up all those fabric bits, trying to keep a check on the overflowing basket under my sewing table! Making a quick quilt can be very rewarding. They're a fast fix for that creative need. They are perfect for when there's time constraints. And they use up some of the ever-growing stash of fabric we all have! ... and best of all, seeing people's reactions when you gift one of your quilts. It also feels good to make something a bit more complex, you know like having a project brewing away in the background, slowly, slowly! Do you find it interesting to follow someone's blog, watching how their special project grows over a period of time & turns into something? I know I do! At present, Vintage Spin quilt is my "something", my "slow burner" project. hoping it'll lay flat when I open it out! Squaring up the circle, hoping they all end up the same size! Thanx for stopping by & reading! A-little-bit-of-pink sampler top - done! 6 x 12"blocks plus assorted filler blocks. and a variety of spots & dots. just like a jigsaw puzzle! Everything got put on hold today while I made a start on Sarah's DYOS quilt. First up I needed to do some cutting, 2 1/2," 4 1/2," 8 1/2"﻿ squares, and a few 1 1/2" & 2 1/2" strips. Then I started sewing it all following her receipe, it was just like doing a jigsaw!! It went together beautifully! Well done Sarah! I did have to rethink my initial plan of using up some "old" blocks, which was, if you recall, the whole reason for doing this in the first place! But nothing felt right with mixing my old with the newer fabrics I had pulled out. Never mind, maybe some things are best left "as old"?!? Maybe I can still use them in the backing? It's a real stash buster that's for sure! Linking up with "Fabric Frensy Friday" later on tonight.